K-State Extension specialists, area agronomists, and county/district agents are again seeking to collaborate with producers in establishing on-farm and large-scale research plots in 2019. Last year, we had on-farm projects in diverse areas around Kansas, setting up tests involving primarily corn and soybeans, with a few studies on sorghum as well. Funding support from Kansas Corn and Kansas Soybean is helping to increase our on-farm network. Research data (small-plots) vs. on-farm data (large-plots): What is the main difference between these scenarios? Are the on-farm protocols the same for all environments and farmers or should the protocols be farmer- or site-specific? Farmers have their own interests and specific questions that need to be properly addressed. Protocols will be designed to fit each farmer’s situation. Some of the diverse topics that we have discussed include: corn/soybean/sorghum seeding rates; corn/sorghum hybrids; sorghum/soybean row spacing; corn/soybean/sorghum planting dates; full or limited irrigation; and other topics. 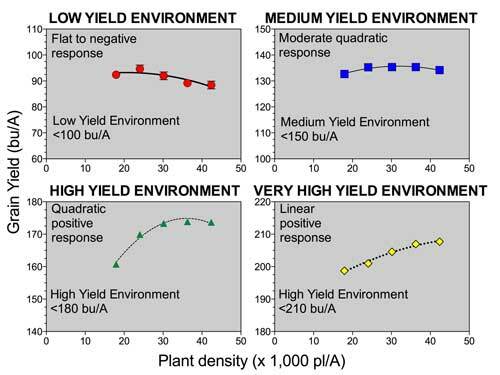 The example in the graphic below shows how the optimum plant density to maximize corn grain yield will vary according to different environments. For the low yielding environment (<100 bu/acre), the agronomically optimum plant density was about 20,000 plants per acre; while for the very high-yielding site (>200 bu/acre), the agronomically optimum plant density is about 35,000 plants per acre. Therefore, different yield potentials in different environments have different “optimum” crop production practices to maximize net returns. 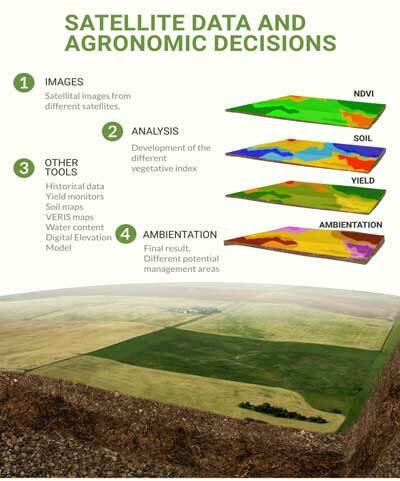 In addition, on-farm studies in 2017-2018 evaluated new technologies and added precision agriculture tools to the evaluation of variability and determination of zone management. Utilization of satellite imagery and precision soil sampling (soil type, altitude, slope), in combination with yield monitor data, allowed us to obtain high-resolution for spatial variability within a field in order to investigate crop production issues and properly address them. This page generated in 0.01719 seconds.